Cadmium, a ubiquitous heavy metal, is a toxic industrial and environmental pollutant. The initial biological response to cadmium exposure is induction of metallothioneins (MTs), a family of cysteine-rich, low-molecular-weight proteins that bind primarily zinc, cadmium, or both. This MT induction protects against cadmium toxicity by quenching cadmium. However, the effects of long-term cadmium exposure on MT1 gene expression are largely unknown. To investigate these effects, we used P1798 mouse lymphosarcoma cells, in which the MT1 gene is suppressed. As previously reported, MT1 expression remained unchanged after cadmium treatment. However, MT1 induction was observed in cells treated with 0.1 µM cadmium for 7 days, then exposed to 10 µM cadmium for 3 hr. In cells treated with 0.1 µM cadmium for 7 days, the transfected MT1 promoter reporter gene transcription and the cadmium incorporation in response to 10 µM cadmium induction were similar to those in untreated P1798 cells. Bisulfite genomic sequencing revealed that 7 day treatment with 0.1 µM cadmium slightly decreased CpG methylation in the 5´ flanking region of the MT1 gene. Our results together show that cadmium treatment results in MT1 induction and epigenetic modification of the MT1 gene. Cadmium is a ubiquitous heavy metal and a major industrial and environmental pollutant (Nordberg, 2007). The main environmental sources of human cadmium exposure are from tobacco smoking and consumption of food (for example, rice, which takes up cadmium from the soil). Owing to cadmium’s high toxicity, the provisional tolerable weekly intake (PTWI) has been set at 7 μg/kg body weight/week, on the basis of the effects on the urine content of α1-macroglobulin, a biomarker of renal tubular dysfunction (Joint FAO/WHO Expert Committee on Food Additives, 2004). Cadmium is a reported epimutagen (Arita and Costa, 2009). Cadmium exposure upregulates DNA methyltransferase (DNMT), which in turn silences DNA-repair genes (Jiang et al., 2008; Zhou et al., 2012; Xu et al., 2016). This silencing might be part of the mechanism underlying cadmium-induced carcinogenesis. Cadmium-associated differentially methylated regions were identified from newborn cord blood and maternal blood samples by genome-wide bisulfite sequencing (Cowley et al., 2018). Moreover, microRNAs, which are involved in epigenetic gene regulation, may also play a role in cadmium’s epigenetic effects. MicroRNA regulation of transforming growth factor-β has been found to underlie the cadmium-mediated inhibition of placental trophoblast cell migration (Brooks and Fry, 2017). After cadmium exposure, metallothioneins (MTs)—a family of cysteine-rich, low-molecular-weight proteins that bind heavy metals, primarily zinc and cadmium—are induced in an initial response (Nordberg, 2007). MT induction protects against cadmium toxicity through binding and quenching cadmium (Klaassen et al., 2009). This protective effect is illustrated by observations that MT-knockout mice are more susceptible than wild-type mice to cadmium-induced liver injury, whereas MT-transgenic mice are more resistant than wild-type mice (Klaassen and Liu, 1998). 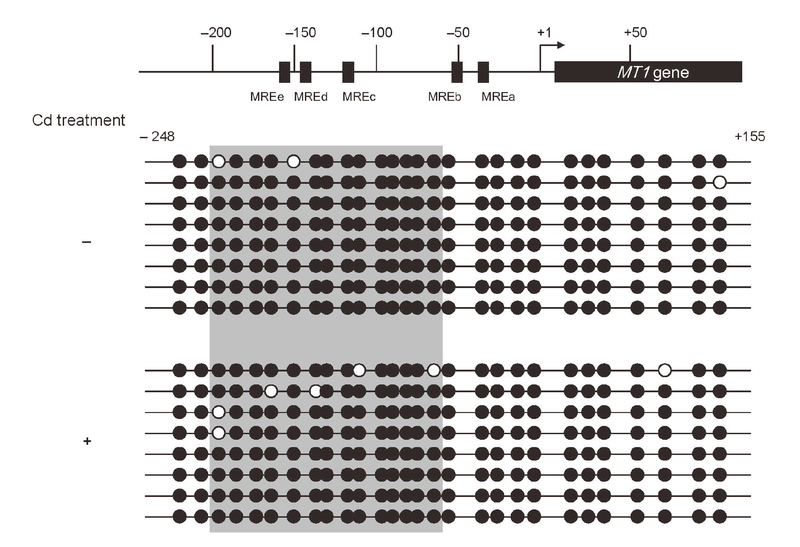 Regarding the mechanism underlying MT induction, the transcription factor metal response element (MRE)-binding transcription factor-1 (MTF-1) plays a central role in sensing heavy-metal signals and transactivates MT genes via the MRE (Kimura et al., 2009; Laity and Andrews, 2007). Several studies have revealed that MT gene expression is modulated by the epigenetic machinery (Ghoshal et al., 2002; Ghoshal et al., 2000; Majumder et al., 1999; Majumder et al., 2006; Okumura et al., 2011). Various heavy metals have been found to affect MT expression through epigenetic mechanisms. For example, zinc deficiency induces epigenetic alterations in the mouse MT2 gene (Kurita et al., 2013). Previously, we reported that chromium(VI) inhibits MT1 gene expression by modifying the transcription potential of the co-activator p300 (Kimura et al., 2008; Kimura et al., 2011). However, the effects of long-term cadmium exposure on MT gene expression, and the possible underlying epigenetic mechanisms, have not been fully elucidated. Such an understanding is important to aid in revising the PTWI for cadmium to account for its epimutagenic effects (Meehan et al., 2018; Rasoulpour et al., 2011; Szyf, 2007). Here, using P1798 mouse lymphosarcoma cells, which have extremely low MT1 expression, we found that long-term cadmium exposure induced marked MT gene expression after subsequent exposure to high cadmium concentrations. We considered the following three possible explanations for this finding: first, cadmium might enhance the responsiveness of the MTF-1/MRE pathway; second, cadmium incorporation after 10 µM cadmium treatment might be elevated in cells subjected to long-term cadmium treatment; and third, the CpG sites in the MT1 promoter might become demethylated. Our results support the third possibility and suggest that cadmium decreases DNA methylation in the CpG sites of the 5´ flanking region of the MT1 gene, thereby enhancing induction of MT1 expression. P1798 mouse lymphosarcoma cells were a gift from Dr. A.E. Thompson, University of Texas, Galveston, TX, USA (Thompson, 1980). These cells were grown in RPMI 1640 medium containing 25 mM HEPES (pH 7.2), 0.2 μM β-mercaptoethanol and 5% fetal bovine serum at 37°C in 5% CO2/95% air. The cells were seeded at a density of 2.5 × 105 cells/mL every 2 days. On the fourth day, the cells were seeded at a density of 1.25 × 105 cells/mL and cultured for 3 days. Cell viability was measured with trypan blue exclusion assays (Strober, 2015). Total RNA was extracted with Isogen reagent (Nippon Gene, Tokyo, Japan), and cDNA was synthesized from the total RNA with a High-Capacity cDNA Reverse Transcription Kit (Applied Biosystems, Foster, CA, USA). Real-time PCR was performed with Premix Ex Taq™ (probe qPCR) (TaKaRa Bio, Inc., Shiga, Japan) with TaqMan probes (for MT1: Mm00496660_g1; for GAPDH: 4352339E; Applied Biosystems, Carlsbad, CA, USA) on an Eco Real Time PCR system (Illumina, Inc., San Diego, CA, USA). The reporter plasmid pGL4.12-MT−264/+42 containing the mouse MT1 promoter, spanning bases −264 to +42 (relative to the transcription start site), was used for MT1 promoter reporter assays. The promoter constructs were cloned into the firefly reporter plasmid pGL4.12[luc2CP], as previously described (Kimura et al., 2008). Transfection was performed with the Neon® transfection system (Thermo Fisher Scientific, Waltham, MA, USA). Electroporation was performed with 10 μL of buffer R containing 2.0 × 105 P1798 cells, 1.0 μg of pGL4.12-MT−264/+42 and 1.0 ng of pRL/SV40 (Promega, Madison, WI, USA). Twenty-four hours after transfection, the cells were treated with cadmium chloride, and luciferase activity was then measured in cellular extracts with a luminometer and the Dual-Luciferase reporter assay system (Promega) according to the manufacturer’s instructions. Radioactive 109Cd (270 MBq/nmol) was purchased from RIKEN (Saitama, Japan) as a 0.1 N HCl solution. The 109CdCl2 solution was diluted with 10 volumes of 10 mM or 100 µM CdCl2 to obtain the appropriate radioactive 109CdCl2 solution. Cells were treated with 10 µM 109CdCl2 (1.4 cpm/pmol 109Cd) for 3 hr at 4°C or 37°C, or cultured for 7 days with 0.1 µM 109CdCl2 (140 cpm/pmol 109Cd). After the indicated times, the cells were washed three times with ice-cold PBS, then collected and lysed with 1 M NaOH. After pH neutralization with 1 M HCl, the radioactivity of the cell lysates was measured with a gamma counter (Auto Well Gamma System ARC-380CL; Aloka, Tokyo, Japan). The protein concentrations of the cell lysates were measured with a Pierce™ BCA Protein Assay Kit (Thermo Fisher Scientific, Waltham, MA, USA). Genomic DNA was purified with a NucleoSpin® Tissue kit (TaKaRa Bio, Inc.). Bisulfite conversion reactions were performed with a MethylEasy™ Xceed Rapid DNA Bisulphite Modification Kit (TaKaRa Bio, Inc.). The bisulfite-treated DNA was amplified with TaKaRa EpiTaq™ HS (TaKaRa Bio, Inc.) under the following PCR conditions: 98°C/30 sec, 60°C/15 sec, and 72°C/1 min × 35 cycles. Methyl Primer Express Software v1.0 (Applied Biosystems) was used to design primers annealing between –248 and +155 of the 5´ flanking region of the mouse MT1 gene (relative to the transcription start site). The sequences of the sense and antisense primers were as follows: 5´-GGGGAAAGTATTATAGGGATATGATGTTT-3´ (forward; underlining indicates T nucleotides that are C nucleotides in the original genomic sequence) and 5´-ATCCCAACTTAATATTCTAAAAACCAAAAA-3′ (reverse; underlining indicates A nucleotides that are G nucleotides in the original genomic sequence). The amplified DNA was ligated into the pGEM-T Easy vector (Promega) and transformed into DH5α cells. The cloned PCR products were sequenced with a Big Dye Terminator v3.1 Cycle Sequencing Kit and analyzed with a DNA analyzer (Applied Biosystems). QUMA (http://quma.cdb.riken.jp/) was used to align, visualize, and quantify sequence data for CpG methylation analysis (Kumaki et al., 2008). Data were analyzed with Tukey’s test in PASW Statistics 18 software (IBM, Armonk, NY, USA). Differences between groups were considered significant at p < 0.05. To investigate the effects of cadmium on MT gene expression, cell viability after cadmium treatment was measured through the trypan blue exclusion method. The cell viability dramatically decreased after 2 days of treatment with 1-2.5 μM cadmium (Fig. 1A). In contrast, no effect on viability was observed after 7 days of treatment with 0.1 µM cadmium. MT1 gene expression was highly repressed in P1798 cells, as is characteristic of these cells. However, in cells transfected with a luciferase reporter plasmid, the exogenous MT1 promoter activity was low at baseline and significantly increased after cadmium treatment in a dose-responsive manner (Fig. 1B). Characterization of P1798 cells. (A) Cell viability after cadmium treatment. P1798 cells were cultured with cadmium at various concentrations (○: 0 µM; □: 0.1 µM;▲: 0.5 µM; ■: 1 µM; and ●: 2.5 µM), and cell viability was measured through trypan blue exclusion assays. (B) Effect of cadmium on MT1-promoter reporter activity. P1798 cells were transfected with the luciferase (Luc) reporter vector pGL4.12-MT−264/+42. A Renilla reporter vector was co-transfected and used for normalization of transfection efficiency. Luc activity was measured in cells exposed to the indicated concentrations of cadmium for 6 hr. Reporter-gene expression was measured with the Dual-Luciferase® Reporter Assay System, and firefly luciferase activity was normalized to Renilla luciferase activity. Values are expressed as Relative Luc activity (means ± SD for three independent experiments). Data represent the mean ± SD of three independent experiments. *p < 0.05, significantly different from untreated cells. As previously reported (Majumder et al., 1999), cadmium (10 μM for 3 hr) did not upregulate MT1 mRNA in P1798 cells relative to that in cells incubated without cadmium (Fig. 2, bars on the left). 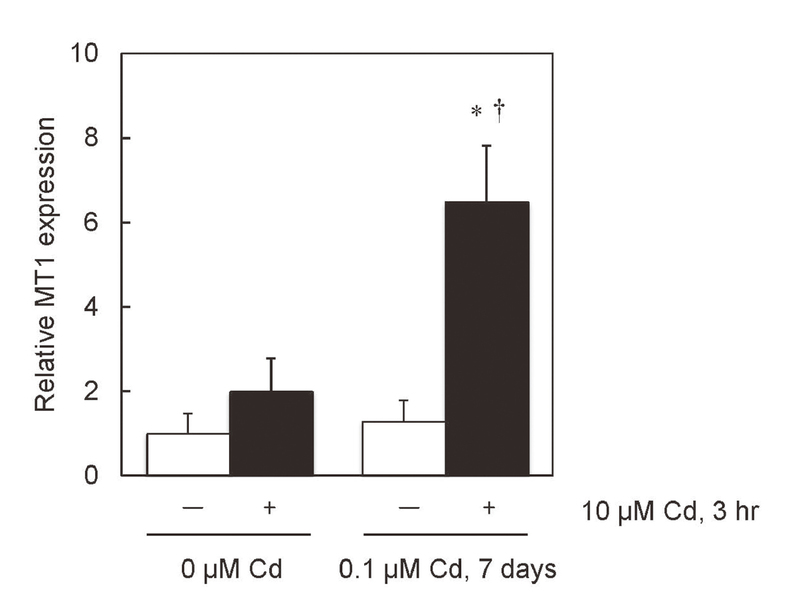 Similarly, incubation with 0.1 µM cadmium for 7 days did not increase MT1 mRNA levels relative to incubation without cadmium; however, subsequent 3-hr treatment with 10 µM cadmium induced significantly more MT1 expression in the cells pretreated with 0.1 µM cadmium for 7 days (Fig. 2, bars on right). Effect of 7 day cadmium exposure on MT1 induction. P1798 cells were cultured for 7 days with 0.1 µM cadmium or without cadmium, then exposed to 10 µM cadmium for 3 hr (+) or left untreated (–). MT1 mRNA was measured through RT-qPCR, and values were normalized to those of GAPDH mRNA. Data represent the mean ± SD of three independent experiments. *p < 0.05, significantly different from the 0 μM Cd, (–) group; †p < 0.05, significantly different from the 0.1 µM Cd, 7 days, (–) group. The transfected MT1 promoter reporter gene transcription increased in a dose-dependent manner after cadmium treatment (Fig. 1B). To explore the possibility that long-term (7 day) cadmium exposure might enhance the sensitivity of the MTF-1/MRE pathway, we compared exogenous MT1 promoter activity in cells exposed long-term (7 day) and unexposed cells. The induction of the exogenous MT1 promoter activity after treatment with 10 μM cadmium was not greater in cells exposed long-term (7 day) to 0.1 µM cadmium than in unexposed cells (Fig. 3A, black bars). Next, we measured incorporated cadmium content. Only low levels of cadmium were incorporated into cells incubated with 0.1 µM cadmium for 7 days (Fig. 3B, left, gray bar). Cadmium incorporation was induced after treatment with 10 μM cadmium for 3 hr at 37ºC (Fig. 3B, left, black bar). The cadmium incorporation level after treatment with 10 μM cadmium for 3 hr at 37ºC did not change after long-term cadmium exposure (Fig. 3B right). Effect of 7 day cadmium exposure on MT1-promoter reporter-gene expression and cadmium incorporation. (A) P1798 cells, treated with 0.1 μM cadmium for 7 days or left untreated, were transfected with the luciferase (Luc) reporter vector pGL4.12-MT−264/+42. A Renilla reporter vector was co-transfected and used for normalization of transfection efficiency. Transfected cells were cultured for 24 hr with or without 0.1 μM cadmium, then incubated with 10 μM cadmium (+) for 6 hr or left untreated (–). Values are expressed as Relative Luc activity (means ± SD for three independent experiments). *p < 0.05, significantly different from the 0 μM Cd, (–) group; †p < 0.05, significantly different from the 0.1 µM Cd, 7 days, (–) group. 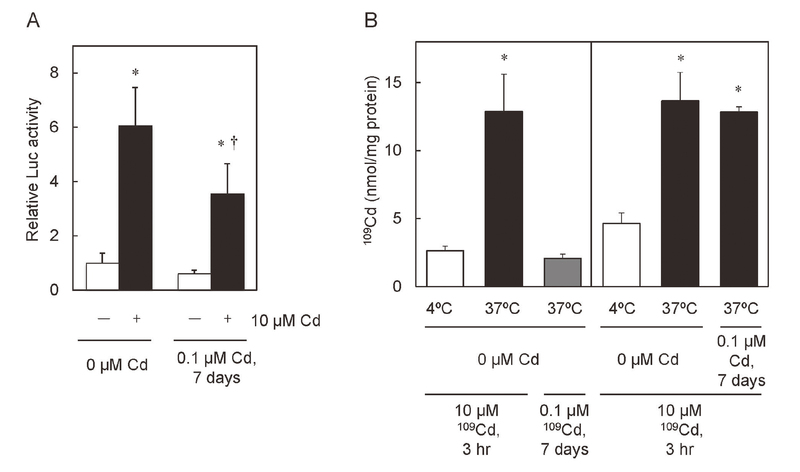 (B) P1798 cells were cultured with 10 μM 109CdCl2 for 3 hr at either 4ºC or 37ºC, or with 0.1 μM 109CdCl2 for 7 days at 37ºC. After the cells were washed with ice-cold PBS, incorporated 109Cd was measured with a gamma counter. *p < 0.05, significantly different from the corresponding 4ºC group. CpG-island DNA in the MT1 promoter is highly methylated in P1798 cells (Majumder et al., 1999). Under our experimental conditions, the percentage of methylated CpG cytosines in the MT1 promoter was at or near 100% (Fig. 4). In contrast, the CpGs in the promoter were slightly demethylated after long-term cadmium exposure (0.1 μM for 7 days). The demethylation sites varied among replicates. Comparison of the DNA methylation status of the MT1 5´ flanking region in P1798 cells untreated or treated with 0.1 μM cadmium for 7 days. Schematic at top shows target regions of MT1 containing the transcription start site and MREs analyzed by bisulfite genomic sequencing. CpG dinucleotides are represented by circles (●: methylated cytosine; ○: unmethylated cytosine). Gray box is the demethylated region (−200 to −55 bp). Each row represents data from a single cell. Cells were treated for 7 days without (–) or with (+) 0.1 μM Cd. Cadmium is an important industrial and environmental pollutant posing a risk to human health. To avoid this risk, the PTWI has been set as 7 μg/kg/week, on the basis of cadmium’s effects on a renal tubular dysfunction biomarker (Joint FAO/WHO Expert Committee on Food Additives, 2004). However, several lines of evidence indicate that cadmium is an epimutagen (Arita and Costa, 2009), for example through upregulation of DNMT expression (Jiang et al., 2008; Zhou et al., 2012; Xu et al., 2016). The mechanisms of the epimutagenic effects in response to long-term cadmium exposure should be elucidated further and considered in determining the PTWI. Here, we found that long-term cadmium exposure decreased DNA methylation in the 5′ flanking region of the MT1 gene and may consequently have caused P1798 cells to become MT inducible. Because MT is cytoprotective against cadmium, P1798 cells, in which MT gene expression is repressed, are highly sensitive to cadmium and were unable to grow in medium containing 1 µM cadmium (Fig. 1A). The repression of MT was not caused by dysfunction in the MTF-1/MRE pathway, which regulates MT expression, because a transfected MRE-driven reporter gene was expressed in response to cadmium treatment (Fig. 1B). MT repression is known to be caused by hypermethylation of the proximal promoter (Majumder et al., 1999). Our results indicate cytosine demethylation of the MT1 promoter in response to cadmium treatment (Fig. 4), confirming findings from previous reports. In addition, we found that in P1798 cells, long-term exposure (7 days) to 0.1 µM cadmium did not increase MT1 mRNA expression; however, this long-term exposure enhanced the MT1 induction in response to subsequent 10 μM cadmium treatment (Fig. 2). Several studies have shown that the average blood cadmium concentration is 0.02 µM or lower (Horiguchi et al., 2013; Ikeda et al., 1995; Järup and Akesson, 2009; Watanabe et al., 2000). Thus, the 0.1 µM cadmium concentration used in our experiments was slightly higher than the average blood concentration in the general population. However, whether the observed effects of cadmium on MT gene expression might be specific to P1798 cells, and might occur in response to cadmium concentrations 0.02 µM or lower, remain to be determined. Regarding the mechanisms underlying the enhanced induction of MT1 gene expression, we considered three possibilities. The first possibility was that cadmium might enhance the sensitivity of the MTF-1/MRE pathway, for example, by increasing MTF-1 protein levels. The second possibility was that the cadmium incorporation after 10 µM cadmium treatment might be elevated in cells subjected to long-term cadmium treatment. The third possibility was that the CpG sites in the MT1 promoter might be demethylated. To explore the first and second possibilities, we measured exogenous MT1 promoter activity and cadmium incorporation: long-term cadmium exposure enhanced neither exogenous MT1 promoter activity (Fig. 3A) nor cadmium incorporation (Fig. 3B). Fujishiro et al. have produced a cadmium-resistant cell line from mouse embryonic fibroblasts by culturing with cadmium (Fujishiro et al., 2009a). In that cell line, cadmium accumulation is repressed, and the zinc and cadmium transporter ZIP8 is downregulated by hypermethylation of CpG sites in the 5’ flanking region of the ZIP8 gene (Fujishiro et al., 2009b). In contrast, in our experiments, cadmium accumulation in P1798 cells after 7 days of cadmium exposure was not altered. Furthermore, in support of the third possibility, in P1798 cells, the 5′ flanking region of the MT1 gene was demethylated after exposure to cadmium: in the −200 to −55 bp region in the MT1 promoter, the percentage of demethylated CpG cytosines increased from 2.8% (2/72) to 6.9% (5/72) (Fig. 4). CpG sites have been reported to be crucial for the regulation of several genes (de Andrés et al., 2013; Ling et al., 2013), and the CpG sites in the MT1 promoter might similarly be crucial. Hypermethylation of CpG sites in the 5′ flanking region of the ZIP8 gene is an adaptation to cadmium in the culture medium. Thus, the demethylation observed in the 5′ flanking region of the MT1 gene might also represent an adaptation to cadmium in the culture medium. However, cadmium has been reported to induce both methylation and demethylation of CpG sites (Vilahur et al., 2015). Cadmium-induced methylation might result from DNMT upregulation, as mentioned above (Jiang et al., 2008; Zhou et al., 2012; Xu et al., 2016). In contrast, cadmium-induced demethylation might be performed by the ten-eleven translocation (TET)-thymine DNA glycosylase (TDG) complex. Demethylation by this complex has been reported to be a mechanism for retinoic acid-induced HIC1 gene expression (Hassan et al., 2017). In the report, the TET-TDG complex performs demethylation within 3 hr. Similar mechanisms might be involved in the enhanced induction of MT1 gene expression reported here. Further studies are needed to clarify the molecular mechanisms of this demethylation. Here, we showed that long-term cadmium exposure enhances MT1 induction after subsequent exposure to high cadmium concentrations and decreases MT1 DNA methylation in P1798 cells. Cadmium has been reported to upregulate DNMT and increase DNA methylation at CpG sites (Jiang et al., 2008; Yuan et al., 2013). In a prenatal zinc-deficiency model, hypermethylation of CpG sites and enrichment in the acetylation of histones H3/H4 in the 5´ flanking region of the MT1 gene have been observed (Kurita et al., 2013). Our results indicate the possibility that cadmium decreases DNA methylation in the CpG sites of the 5´ flanking region of the MT1 gene and enhances induction of MT1 expression. This work was supported by JSPS KAKENHI grant number JP25460179 (to T.K.). We are indebted to Fuyuri Fukumoto, Ryo Kimura and Mami Kawashima for excellent technical assistance. Arita, A. and Costa, M. (2009): Epigenetics in metal carcinogenesis: nickel, arsenic, chromium and cadmium. Metallomics, 1, 222-228. Brooks, S.A. and Fry, R.C. (2017): Cadmium inhibits placental trophoblast cell migration via miRNA regulation of the transforming growth factor beta (TGF-β) pathway. Food Chem. Toxicol., 109, 721-726. Cowley, M., Skaar, D.A., Jima, D.D., Maguire, R.L., Hudson, K.M., Park, S.S., Sorrow, P. and Hoyo, C. (2018): Effects of cadmium exposure on DNA methylation at imprinting control regions and genome-wide in mothers and newborn children. Environ. Health Perspect., 126, 037003.
de Andrés, M.C., Imagawa, K., Hashimoto, K., Gonzalez, A., Roach, H.I., Goldring, M.B. and Oreffo, R.O. (2013): Loss of methylation in CpG sites in the NF-κB enhancer elements of inducible nitric oxide synthase is responsible for gene induction in human articular chondrocytes. Arthritis Rheum., 65, 732-742. Fujishiro, H., Okugaki, S., Kubota, K., Fujiyama, T., Miyataka, H. and Himeno, S. (2009a): The role of ZIP8 down-regulation in cadmium-resistant metallothionein-null cells. J. Appl. Toxicol., 29, 367-373. Fujishiro, H., Okugaki, S., Yasumitsu, S., Enomoto, S. and Himeno, S. (2009b): Involvement of DNA hypermethylation in down-regulation of the zinc transporter ZIP8 in cadmium-resistant metallothionein-null cells. Toxicol. Appl. Pharmacol., 241, 195-201. Ghoshal, K., Datta, J., Majumder, S., Bai, S., Dong, X., Parthun, M. and Jacob, S.T. (2002): Inhibitors of histone deacetylase and DNA methyltransferase synergistically activate the methylated metallothionein I promoter by activating the transcription factor MTF-1 and forming an open chromatin structure. Mol. Cell. Biol., 22, 8302-8319. Ghoshal, K., Majumder, S., Li, Z., Dong, X. and Jacob, S.T. (2000): Suppression of metallothionein gene expression in a rat hepatoma because of promoter-specific DNA methylation. J. Biol. Chem., 275, 539-547. Hassan, H.M., Kolendowski, B., Isovic, M., Bose, K., Dranse, H.J., Sampaio, A.V., Underhill, T.M. and Torchia, J. (2017): Regulation of active DNA demethylation through RAR-mediated recruitment of a TET/TDG complex. Cell Rep., 19, 1685-1697. Horiguchi, H., Oguma, E., Sasaki, S., Okubo, H., Murakami, K., Miyamoto, K., Hosoi, Y., Murata, K. and Kayama, F. (2013): Age-relevant renal effects of cadmium exposure through consumption of home-harvested rice in female Japanese farmers. Environ. Int., 56, 1-9. Ikeda, M., Moon, C.S., Zhang, Z.W., Iguchi, H., Watanabe, T., Iwami, O., Imai, Y. and Shimbo, S. (1995): Urinary alpha1-microglobulin, beta2-microglobulin, and retinol-binding protein levels in general populations in Japan with references to cadmium in urine, blood, and 24-hour food duplicates. Environ. Res., 70, 35-46. Järup, L. and Akesson, A. (2009): Current status of cadmium as an environmental health problem. Toxicol. Appl. Pharmacol., 238, 201-208. Jiang, G., Xu, L., Song, S., Zhu, C., Wu, Q., Zhang, L. and Wu, L. (2008): Effects of long-term low-dose cadmium exposure on genomic DNA methylation in human embryo lung fibroblast cells. Toxicology, 244, 49-55. Joint FAO/WHO Expert Committee on Food Additives. (2004): Evaluation of certain food additives and contaminants. In: World Health Organization Technical Report Series, pp. 1-176. Kimura, T., Itoh, N. and Andrews, G.K. (2009): Mechanisms of heavy metal sensing by metal response element-binding transcription factor-1. J. Health Sci., 55, 484-494. Kimura, T., Li, Y., Okumura, F., Itoh, N., Nakanishi, T., Sone, T., Isobe, M. and Andrews, G.K. (2008): Chromium(VI) inhibits mouse metallothionein-I gene transcription by preventing the zinc-dependent formation of an MTF-1-p300 complex. Biochem. J., 415, 477-482. Kimura, T., Okumura, F., Onodera, A., Nakanishi, T., Itoh, N. and Isobe, M. (2011): Chromium (VI) inhibits mouse metallothionein-I gene transcription by modifying the transcription potential of the co-activator p300. J. Toxicol. Sci., 36, 173-180. Klaassen, C.D. and Liu, J. (1998): Metallothionein transgenic and knock-out mouse models in the study of cadmium toxicity. J. Toxicol. Sci., 23 (Suppl 2), 97-102. Klaassen, C.D., Liu, J. and Diwan, B.A. (2009): Metallothionein protection of cadmium toxicity. Toxicol. Appl. Pharmacol., 238, 215-220. Kumaki, Y., Oda, M. and Okano, M. (2008): QUMA: quantification tool for methylation analysis. Nucleic Acids Res., 36, W170-175. Kurita, H., Ohsako, S., Hashimoto, S., Yoshinaga, J. and Tohyama, C. (2013): Prenatal zinc deficiency-dependent epigenetic alterations of mouse metallothionein-2 gene. J. Nutr. Biochem., 24, 256-266. Laity, J.H. and Andrews, G.K. (2007): Understanding the mechanisms of zinc-sensing by metal-response element binding transcription factor-1 (MTF-1). Arch. Biochem. Biophys., 463, 201-210. Ling, L., Ren, M., Yang, C., Lao, G., Chen, L., Luo, H., Feng, Z. and Yan, L. (2013): Role of site-specific DNA demethylation in TNFα-induced MMP9 expression in keratinocytes. J. Mol. Endocrinol., 50, 279-290. Majumder, S., Ghoshal, K., Li, Z., Bo, Y. and Jacob, S.T. (1999): Silencing of metallothionein-I gene in mouse lymphosarcoma cells by methylation. Oncogene, 18, 6287-6295. Majumder, S., Kutay, H., Datta, J., Summers, D., Jacob, S.T. and Ghoshal, K. (2006): Epigenetic regulation of metallothionein-i gene expression: differential regulation of methylated and unmethylated promoters by DNA methyltransferases and methyl CpG binding proteins. J. Cell. Biochem., 97, 1300-1316. Meehan, R.R., Thomson, J.P., Lentini, A., Nestor, C.E. and Pennings, S. (2018): DNA methylation as a genomic marker of exposure to chemical and environmental agents. Curr. Opin. Chem. Biol., 45, 48-56. Nordberg, G. (2007): Handbook on the toxicology of metals. Academic Press, Amsterdam; Boston. Okumura, F., Li, Y., Itoh, N., Nakanishi, T., Isobe, M., Andrews, G.K. and Kimura, T. (2011): The zinc-sensing transcription factor MTF-1 mediates zinc-induced epigenetic changes in chromatin of the mouse metallothionein-I promoter. Biochim. Biophys. Acta, 1809, 56-62. Rasoulpour, R.J., LeBaron, M.J., Ellis-Hutchings, R.G., Klapacz, J. and Gollapudi, B.B. (2011): Epigenetic screening in product safety assessment: are we there yet? Toxicol. Mech. Methods, 21, 298-311. Strober, W. (2015): Trypan blue exclusion test of cell viability. Curr. Protoc. Immunol., 111, A3.B.1-A3.B.3. Szyf, M. (2007): The dynamic epigenome and its implications in toxicology. Toxicol. Sci., 100, 7-23. Thompson, E.A. Jr. (1980): Properties of a cell-culture line derived from lymphosarcoma P1798. Mol. Cell. Endocrinol., 17, 95-102. Vilahur, N., Vahter, M. and Broberg, K. (2015): The epigenetic effects of prenatal cadmium exposure. Curr. Environ. Health Rep., 2, 195-203. Watanabe, T., Zhang, Z.W., Moon, C.S., Shimbo, S., Nakatsuka, H., Matsuda-Inoguchi, N., Higashikawa, K. and Ikeda, M. (2000): Cadmium exposure of women in general populations in Japan during 1991-1997 compared with 1977-1981. Int. Arch. Occup. Environ. Health, 73, 26-34. Xu, P., Wu, Z., Xi, Y. and Wang, L. (2016): Epigenetic regulation of placental glucose transporters mediates maternal cadmium-induced fetal growth restriction. Toxicology, 372, 34-41. Yuan, D., Ye, S., Pan, Y., Bao, Y., Chen, H. and Shao, C. (2013): Long-term cadmium exposure leads to the enhancement of lymphocyte proliferation via down-regulating p16 by DNA hypermethylation. Mutat. Res., 757, 125-131. Zhou, Z.H., Lei, Y.X. and Wang, C.X. (2012): Analysis of aberrant methylation in DNA repair genes during malignant transformation of human bronchial epithelial cells induced by cadmium. Toxicol. Sci., 125, 412-417.